2 Where does your dog spend most of their time? 3 What kind of dog do you own? 4 Does anyone have dog allergies in your home? 5 How active is your dog? 6 Does your dog have a skin irritation? Dogs aren't typically eager to jump into the tub to get bathed. For the dog owners, it is a time-consuming, messy, and frustrating process, so it isn't really enjoyable for anyone involved. Given your dog a bath probably isn't something you want to do every week, but you should be aware that it’s really necessary, so how often should you do it? Read on to find out the answer. There is no one right answer for how often a dog needs to be bathed as it depends on a number of factors. Usually, you can bathe him once a week. However, dogs, like most animals, groom themselves which helps keep their skin healthy, but this can't be the only time they get a thorough cleaning. You need to keep in mind, however, that bathing your dog too often can lead to skin irritation and damaged hair follicles which will result in fungal and bacterial infections. By answering the following question, you are able to better determine just how often your dog needs to be bathed to keep them clean and their skin healthy. Where does your dog spend most of their time? Is your dog indoors or outdoors most of the time? If your dog spends more time indoors, and is on the furniture or sleeps in your bed, then you might want to bathe them more often. Some breeds may need a bath once a week and others may need to be bathed once a month, which may seem like a lot. Take into consideration when they do go outdoors, they dig in the dirt which means their paws and fur can have plenty of insects, poop and other grime that they bring indoors with. While bathing them, you will keep all the outdoor stuff they carry in off your furniture or bed. How often should you bathe your dog will depend on the breed of dog you have. Dogs, such as Labradors, Collies and Shelties, have harsher textured coats, which means they tend to not get dirty like finer or softer coated dogs. Other dogs like Yorkies, Shih Tzus, Maltese, and Afghans are dogs without undercoats and should be bathed about once a week. For mixed breed dogs or dogs you are unsure of the breed, you should bathe as often as possible as dogs that are clean tend to be happier. For the most common breed of dogs, refer to the chart below to determine how often you should bathe them. Does anyone have dog allergies in your home? If a family member is allergic to dogs, you should bathe your dog frequently as this will help remove built-up dander from the fur. Most dogs will have some level of activity. From going to the dog park, rolling in the grass to swimming and playing with other dogs, consider what activities your dog does often. Active dogs will need to be bathed more frequently to keep them clean and smelling fresh. Keep in mind that with more baths, your dogs will have drier skin. Does your dog have a skin irritation? Dogs can suffer from allergies just as humans, but instead of through their noses, these allergies often affect their skin instead. If your dog has itchy skin, then bathing them weekly can help reduce skin allergies. Now that you know how often should you bathe your dog, you want to know how to properly bathe your dog as well as how to make the process easier for both you and your dog. Refer to the tips and suggestion below to successfully groom your dog. 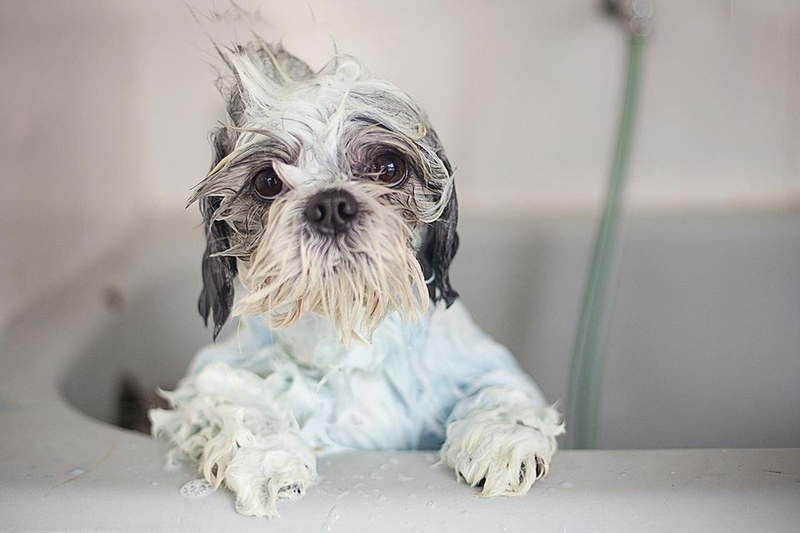 Before giving your dog a bath, you want them to have a positive attitude towards getting a bath. Entice your dog with treats or toys to get them to the bath and allow them to get familiar with the tub prior to filling it with water by letting them hop in it. This may take some repetition, but it will make the bathing process easier. It is best to do this from a young age so that your dog will be less likely to have any negative attitudes towards receiving a bath. Trimming your dog's nails prior to bathing will give them more traction when in a tub, sink, or kiddie pool. To reduce the amount of fur that can get stuck in the drains, give your dog a thorough brushing before you bathe them. Consider using a mesh sponge to prevent any additional hair from going down the drain. Dogs with medium to long coats should be brushed again after being given a bath to remove any excess fur. Using warm water when bathing will also reduce the amount of shedding that occurs. You don't want to use a harsh shampoo that will end up stripping the natural oils from your dog's skin. The wrong shampoo will not only dirty out their skin more, but will also cause them to scratch and itch more. After you know "how often should you bathe your dogs", this is next thing you want to consider since the right shampoo is vital. A mild soap will often be the best option as it will keep your dog clean and smelling fresh. Try diluting the shampoo you use with water to speed up the application and rinsing process. When you do bathe him, start at the neck and then work your way down. Use a large cup or pitcher to rinse to avoid frightening your dog with the sound of the faucet. Avoid the ears and use caution when washing the face, which is best done by using a washcloth. Server responsed at: 04/25/2019 4:05 p.m.